We’re changing the way we name product updates to make things simpler and to unify our approach for Microsoft Dynamics CRM Online and Microsoft Dynamics CRM (on-premises). To understand the new naming conventions, let’s first take a look at version numbers in CRM. CRM Online. Product names for minor releases of CRM Online will now include the year as part of the name. For example, the spring release of CRM Online for 2015 is CRM Online 2015 Update 1. 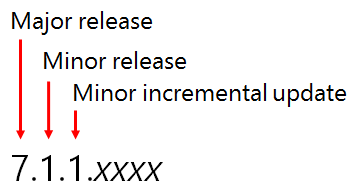 If there’s an incremental update that applies to the minor release, it will be appended to the name. For example, the first incremental update to the spring 2015 release would be called CRM Online 2015 Update 1.1. CRM (on-premises). In the past, incremental updates for the on-premises version of Microsoft Dynamics CRM were called “Update Rollups”. In the future, Update Rollups will just be called “Updates” and will be associated with the third digit of the version number. 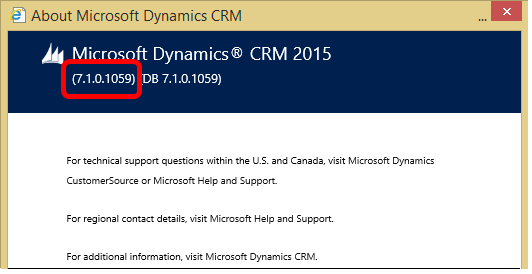 For example, the first incremental update for version 7.0 is CRM 2015 Update 0.1. The complete version number in this case is 7.0.1.xxxx, which indicates that the update applies to the major 7.0 release, not a spring release. There will not be a spring 2015 release for the on-premises version, but if there’s a minor fall release, it would be called CRM 2015 Update 2, and any subsequent incremental updates would be appended to that number. CRM for phones. The new phone app introduced with CRM Online 2015 Update 1 will be called CRM for phones. The CRM phone app for CRM 2013 and CRM 2015 will now be called CRM for phones express. The following table shows CRM Online product names with their associated version numbers and code names. The following table shows CRM (on-premises) product names with their associated version numbers and code names. We hope this blog demystifies naming conventions for CRM going forward!